New York, USA -- Religious images live switched-on, switched-off lives. I remember walking through the National Museum in Kyoto, Japan, some years back, taking in its rows of Buddhist sculpture, and being stopped by one piece, not because it was especially beautiful - it wasn’t - but because a vase with a single fresh flower had been placed in front of it, like an offering in a temple. I stayed with the image because someone - a guard? a visitor? - was telling me, in terms I don’t often think of in museums, that it was important, in a personal, spiritual way. << “Parinibbana,” left, from around 1198, and “Earth Goddess (Vasudhara),” from the 19th century. That dynamic is worth keeping in mind at the quietly majestic exhibition “Buddhist Art of Myanmar” at Asia Society. You won’t see offerings of flowers, but hands-on, eyes-on, minds-on devotion is what much of the art is about. Even if your interest is strictly aesthetic or historical, the show is a find, because chances are you won’t have seen much of this kind of art before. In 1962, Myanmar - which was called Burma and is wedged high up in Southeast Asia between India and China - closed its doors to the world and threw away the keys for almost 40 years. Under surveillance-obsessed military rule, little from outside could get in, and little from inside could get out, including art. There was Myanmar art in the West - England and Germany had made out like the colonial bandits they were - but very little in the United States. Finally, in the early 2000s, Myanmar re-established cautious international contact and began to advertise, in the interest of tourism, its cultural riches. 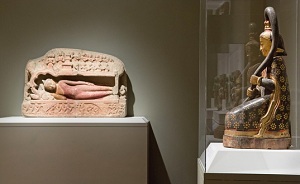 Loans of art became possible, among the first a big one to the Metropolitan Museum for “Lost Kingdoms: Hindu-Buddhist Sculpture of Early Southeast Asia” last year. Even then, at the last minute, promised pieces were held back, though extraordinary things came through, the largest being a monumental stone stele, carved on both sides with mysterious, apparently non-Buddhist figures and dating from around the fourth century. The stele, its code still not cracked, is also at Asia Society, though it’s one of only two objects, the other a silver statuette of the Buddha, shared by exhibitions unalike in intention and scope. The Met’s was a horizontal survey of some 160 works from across Southeast Asia dated within a particular time frame. By contrast, Asia Society has assembled fewer than 70 pieces to take a vertical look at one country’s art over a long history. By the time the stele was carved, Myanmar was dominated by several regional multiethnic groups, of which one called the Pyu produced a large amount of surviving art. Its main religion seems to have been a locally customized form of Buddhism brought from India but originating in Sri Lanka: monastically centered, based on Pali scripture and missing the population of deities that developed in the Himalayas. 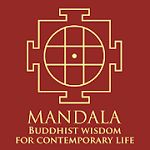 The Buddha-as-monk is a recurrent image in the show, which has been organized by Sylvia Fraser-Lu and Donald M. Stadtner, with Adriana Proser. The first things you see in a large second-floor gallery are small metal or stone statues of him blessing, preaching and wrapped in a simple robe. Whether made for rituals, private worship or as pilgrimage souvenirs, each is basically a mobile communication device, a spiritual smartphone kept close for use on the road or at home. The most compact of all of them, a thumb-length Buddha cut from white quartz, has been rubbed almost featureless, as if from constant handling. At some point after it was carved in the eighth or ninth century, the Pyu inexplicably disappeared from the record, and another group, the Mon, with a capital city at Bagan (formerly Pagan), became dominant. Polished and personable, Mon art is striking for its stylistic breadth. At the center of the gallery stands a pert, two-foot-tall bronze Buddha cast in the 11th or 12th century. Head held high, feet together, shoulders back, he has the confidence of a champion swimmer poised before a dive. Another Buddha, however, from the same time and place, this one carved from wood, has a very different demeanor. With his boxy body, rounded shoulders and eyes cast down, he’s the picture of humility despite wearing a fancy crown. But even with contrasts of material and mood, the two figures share DNA. You see a subtle family resemblance - broad, square faces, Cupid-bow smile - and evidence of an Indian influence that Myanmar artists, from this time on, would gradually leave behind. A conventional exhibition might track that leaving-behind chronologically, phase by phase. This one doesn’t. As if acknowledging both the complexities of Myanmar cultural history and the yawning gaps in information - on-the-ground research is still stymied by government control - the Asia Society curators have wisely organized their show not by time but by theme, the main one being the practice of devotion. This gives them freedom to mix together all sizes, uses and periods, and they really go for it. Right around the corner from the pint-size Pyu figures, they’ve installed a towering piece of religious theater: a lacquered wood shrine, glinting with gilt and cut glass and rising, tier upon tier, to the ceiling, with a bejeweled Buddha sitting up top. Here we jump from the ninth to the 19th century, when Myanmar became a British colony. Worlds have changed, but the Buddha’s still there, looking more master-of-the-universe than monk - Buddhism has always had an empire-friendly martial side - but as smilingly unflappable as ever. And as ever, early and late, stories about him are in the air, on the lips of the faithful and illustrated in art. Some are moral tales about his pre-Buddha lives. In one, a favorite in Southeast Asia, he was born as a prince named Vessantara, who, in a lunatic charitable campaign, gave away everything he had, including his two children. You can see the parental off-loading in progress on a sequin-spangled wall embroidery made of velvet, gold-wrapped thread and imported British flannel. In his life as Vessantara, the Buddha earned his karmic wings and was reborn just one last time as another prince, Siddhartha. For some years, Siddhartha lived a bubble-baby existence. But news of reality, cold and harsh, seeped in. He knew he had to face it, and one night he left home for good, his horse carried aloft by gods so its hoof beats wouldn’t be heard. Then finally, after years of self-searching, he arrived at a letting-go enlightenment, though not before certain celestial no-goodniks tried to block his way. We see two of them, potbellied, green of skin, weapons drawn, clomping across a glazed 15th-century temple tile. Technically, they’re demons, but they’re also fantastical fun, as are many of Buddhism’s supporting players, with their folk-art additives. These include guardian ogres with faces like pugs with tusks and nymphs with half-bird, half human bodies who, with a pretty dance and a flutter of stained-glass wings, bid you goodbye at the end of the show. But before you leave, there are a couple of things worth an extra look. One, in a case between the two nymphs, is a 17th-century gilded bronze image of the seated Buddha. With his short neck, cool shape-up haircut, plain off-the-shoulder robe, and round face bent forward and down, he’s as close as any Myanmar work here comes to embodying a Buddhist physical ideal. If his significance is primarily art historical, that of the second figure is, potentially at least, more personal. This one, from the collection of the Bagan Archaeological Museum, is larger, older - from the 11th century - and carved from sandstone. Also a seated Buddha, it has in recent years gained a popular religious following as the perceived prototype of an ardently worshiped image at a local shrine. At Asia Society, to my eye, the piece looks only mildly charismatic. Years ago, someone scoured away all traces of the paint that once brightened the figure. And the sandstone surface, which can be so sensuous, looks over-cleaned, sandblasted, dead. But pilgrim-visitors to the Bagan Museum don’t care about any of this. Belief supplies color, texture, life. In the museum, they bow and pray. Religious art, no matter where you find it in a lot of the world, works that way. 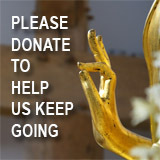 “Buddhist Art of Myanmar” runs through May 10 at Asia Society, 725 Park Avenue, at 70th Street; 212-288-6400, asiasociety.org.